Sheppard took up the saxophone at 19, highly motivated after encountering the music of John Coltrane, and three weeks after getting his first instrument was playing in public with the Bristol-based quartet Sphere. 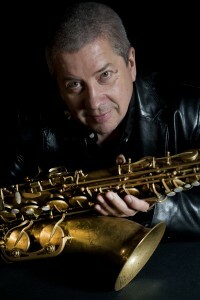 After a period in Paris where he worked with groups including performance art band Urban Sax, he returned to the UK in the mid-80’s recording the album “Andy Sheppard” for Antilles/Island, with Steve Swallow as producer, the beginning of a long musical association that continues to this day. Since then Sheppard has recorded for labels including Blue Note, Verve, Label Bleu and Provocateur. Sheppard has been invited to compose for large and small ensembles in the areas of jazz and contemporary classical music. His big band writing includes work with the renowned UMO Orchestra (Finland), the Bergen Big Band (Norway) – initially for a joint commission from Cheltenham and Vossa Festivals – Voice of the North and Jambone (UK). Most recently in 2012, Sheppard was commissioned to write a new Big Band Suite for the Bergen Big Band, this brand new work entitled Bump 5250 was performed during the prestigious NattJazz Festival (Norway) in 2013. He wrote music for a collaboration with the classical saxophonist John Harle, and composed View from the Pyramids, a concerto for saxophone and piano for the Bournemouth Sinfonietta, which premiered at the 1998 Salisbury Festival with Joanna MacGregor as piano soloist. Other significant commissions include a solo performance piece for saxophone and electronics from the Maison de la Culture in Amiens which subsequently turned into his Nocturnal Tourist CD; Nothing moved but the wind – a work for the Kintamarni Saxophone Quartet; Strange Episode – a piece for tape oboe and percussion for New Noise; the multi-disciplinary Cityscapes – a collaboration with Joanna McGregor et al for the City of London Festival; Glossolalia – a choral work with saxophone, guitar and percussion soloists commissioned by Bigger Sky and the Norfolk & Norwich Festival with premiere in Norwich Cathedral and new big band and vocal work for the northern youth big band Jambone with youth choir, which premiered at the Gateshead International festival in 2012. Curiously, Sheppard has been commissioned to write music to commemorate two feats of UK engineering. Sheppard has been described as a serial collaborator, playing recording and developing new music with artists as varied as Brazilian percussionist Nana Vasconcelos, Indian violinist L.Shankar, English folk musician Kathryn Tickell, contemporary classical composer-performers John Harle and Joanna MacGregor, singer songwriter John Martyn, and a myriad of leading jazz figures, including the rare hat-trick of three of the seminal composers in contemporary Jazz – Carla Bley, George Russell and the late Gil Evans. Sheppard’s current performing priority is Andy Sheppard Quartet/Surrounded by Sea, his third ECM album is a strongly atmospheric recording. Extending the range of his widely-praised Trio Libero (ECM) project in 2012 with Michel Benita and Seb Rochford, Andy Sheppard adds Eivind Aarset (who made significant contributions to 2008’s Movements In Colour) to the band. With Aarset’s ambient drones and electronic textures as a backdrop, Sheppard and co seem to have even more space to explore. The music embraced includes new compositions, open improvisations, an Elvis Costello tune, and the Gaelic traditional ballad “Aoidh, Na Dean Cadal Idir”.